Dry Casks 101: What Do Robots Have to do With Dry Cask Storage? Cutting-edge robot technology is making it easier to inspect inside spent fuel dry cask storage systems. You may remember from past blog posts that most spent fuel dry cask storage systems, or casks, consist of stainless steel canisters that are welded shut to safely contain the radioactive contents. The canisters are in turn placed inside thick storage overpacks to shield plant workers and the public from radiation. As these casks remain in use for longer time frames, the ability to inspect canister surfaces and welds will become an important aspect of the NRC’s confidence in their safety. To be clear: techniques for inspecting canister surfaces and welds have been used for decades. These techniques are collectively known as nondestructive examination (NDE) and include a variety of methods, such as visual, ultrasonic, eddy current and guided wave examinations. Where do robots come in? They are a delivery system. Robots are being developed to apply these NDE techniques inside casks. Not just any robot will do. These robots need to fit into small spaces and withstand the heat and radiation inside the cask. The state-of-the-art is evolving quickly. To date, the Electric Power Research Institute and cask manufacturers have successfully demonstrated robotic inspection techniques to NRC staff three times: at the Palo Verde plant in Arizona (Sept. 2-3, 2015), at the McGuire plant in North Carolina (May 16-19, 2016), and just last month, at Maine Yankee (July 12-13, 2016). 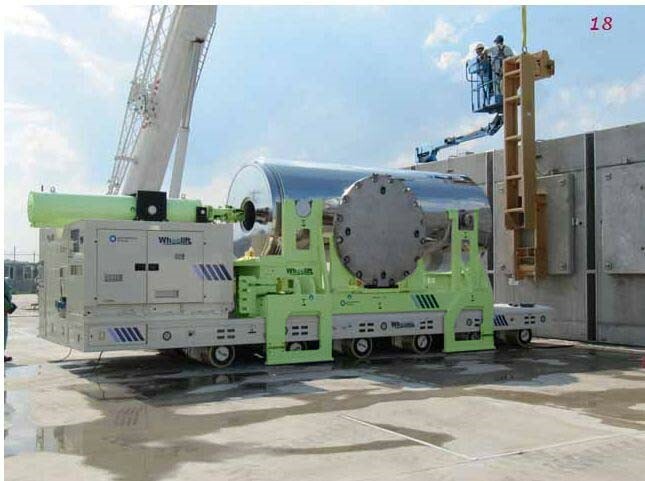 At Palo Verde, the robot was used to deliver eddy current testing instrumentation inside a cask. Eddy current testing detects variations in electromagnetically induced currents in metals. Because it is sensitive to surface defects, eddy current testing is a preferred method for detecting cracks. The inspection robot was used to examine part of the mockup canister fabrication weld. An EPRI report provides a detailed description of the Palo Verde test. Future reports are expected on the McGuire and Maine Yankee demonstrations. These demonstrations are helping to refine the robots’ designs. The Maine Yankee demo was conducted in July 2016 on a cask loaded in 2002. The demo involved a robot maneuvering a camera with a fiber optic probe, which meets the industry code for visual examinations, inside the cask. The probe was able to access the entire height of the canister, allowing the camera to capture images of the fabrication and closure welds. The welds showed no signs of degradation. The canister was intact and in good condition. The robot was also able to obtain samples from surfaces of the cask and canister. These samples are being analyzed for atmospheric deposits that could cause corrosion. Ultimately, if degradation is identified, cask users would select their preferred mitigation and repair option. They would have to meet the NRC’s safety requirements before implementing it. Cask inspections are important to ensure continued safe storage of spent nuclear fuel and robots will continue to be a helpful tool in this important activity. Author ModeratorPosted on August 4, 2016 August 3, 2016 Categories Dry Casks 101Tags dry cask storage systems, EPRI, nuclear power plants, robots, spent nuclear fuel6 Comments on Dry Casks 101: What Do Robots Have to do With Dry Cask Storage? Evaluating the structure of a spent fuel storage cask is a key part of our licensing process. In its application, the cask designer must provide an evaluation that shows the system will be strong and stable enough to resist loads that may be placed on it. NRC structural and materials engineers scrutinize this evaluation to make sure the design meets our regulatory requirements. In our structural review, we make sure the system can perform those functions even after experiencing a load, such as if the cask were dropped. We look at the structural design and analysis of the system under all credible loads for normal conditions—that is, planned operations and environmental conditions that can be expected to occur often during storage. We also look at off-normal conditions, accidents and natural phenomenon events. “Off-normal” describes the maximum conditions that can be expected to from time-to-time, but not regularly. An example is the highest pushing or pulling force on a horizontal canister when it is being placed inside the storage overpack. Accident conditions and natural phenomenon include a dropped cask, earthquakes, tornadoes, flooding and any other credible accident or environmental condition that could affect the structural integrity of the system. These requirements are outlined in 10 CFR Part 72. The structural review looks at whether the cask designer evaluated the proper loading conditions. It will also ensure the designer evaluated the system’s response to those loads accurately and completely. The reviewers must verify whether the resulting stresses in the material meet the acceptance criteria in the appropriate code. As we explained in an earlier post, codes and standards are guidelines typically developed over many years of experience and through industry-wide and government agreement. Some of the more common codes an applicant may use come from the American Society of Mechanical Engineers, the American Society of Civil Engineers, the American Concrete Institute, the American Institute of Steel Construction and the American Welding Society. Not all loads are likely to occur at one time, but some might occur together. So we look at several different combinations of loads that can be expected at the same time. These include dead loads (which come just from the weight of the material), live loads, (which come from the movement of the system or people and things near it), and environmental loads (including snow, ice, wind, temperature and seismic). For example, the cask could experience a dead load, live load, snow load and wind load together. But it is not reasonable to expect the cask to be in a snow storm, a tornado and an earthquake at the same time. These cases are analyzed to determine the stresses placed on the material used to construct the cask system. This analysis may be completed by either hand calculations or by a computer model. Typically, we only look at the maximum stresses in the different materials—since lesser stresses would not be as challenging to the system. The maximum stresses from the analysis are compared to the allowable stresses from the appropriate code to determine a margin of safety. These design margins are typically large. This is because designs must be robust enough to withstand the accident scenarios. To be conservative, we and the designers overestimate loads and underestimate material strength. Doing this adds conservatisms and enhances our assurance that the design is adequate. In this series we’ve been talking about storing spent nuclear fuel in dry casks. One major function of these casks is to cool the fuel. Keeping the spent fuel from getting too hot is one way to ensure casks will be safe. As the fuel cools, heat is transferred from inside the cask to the outside. Spent fuel releases heat as a result of its radioactive decay. This is called decay heat. A key function of dry storage casks is to move the decay heat from the cask to the outside environment to ensure the fuel and cask components do not get too hot. Our experts look at how that heat will move through the cask and into the environment. The method used to remove heat has to be reliable and provable. Heat must also be removed in a way that is passive—meaning no electrical power or mechanical device is needed. Casks use conduction, convection and radiation to transfer the heat to the outside. The graphic shows the three heat transfer methods. As you can see, conduction transfers heat from the burner through the pot to the handle. The process of heat rising (and cold falling) is known as convection. And the heat you feel coming off a radiator, or a hot stove, is known as radiant heat. We limit how hot the cask components and fuel materials can get because we want to protect the cladding, or the metal tube that holds the fuel pellets. Limiting the heat is one important way we can ensure the cladding doesn’t degrade. The cask must keep spent fuel cladding below 752 degrees Fahrenheit during normal storage conditions—a limit that, based on the material properties of the cladding, will prevent it from degrading. The fuel must also remain below 1058 degrees in off-normal or accident conditions (such as if a cask were dropped while it is being positioned on the storage pad, or if a flood or snow were to block the vents). We also confirm the pressure inside is below the design limit to make sure the pressure won’t impact the structure or operations. Our experts review applications for new cask designs carefully to verify the fuel cladding and cask component temperatures and the internal pressure will remain below specified limits. Each storage cask is designed to withstand the effects from a certain amount of heat. This amount is called the heat load. We look at whether the designer correctly considered how the heat load will affect cask component and fuel temperatures. We review how this heat load was calculated. We also verify that the cask designer looked at all the environmental conditions that can be expected because these will also affect the cask component and fuel temperatures. These may include wind speed and direction, temperature extremes, and a site’s elevation (which can affect internal pressure). To make sure the right values are considered, we verify they match the historical records for a site or region. We review all of the methods used to prove that the storage system can handle the specified heat loads. We also verify any computer codes used in the analysis and the values that were plugged in. For example, we look at the material properties for cask components used in the code. We look at calculations for temperatures and pressure. We make sure the computer codes are the latest versions. And we only allow designers to use codes that have been endorsed by experts. We might run our own analysis using a different computer code to see if our results match the application. The analysis and review allow us to see whether and how the dry cask will meet the temperature limits. Our review ensures the temperature is maintained and the cladding is protected. Finally, our review confirms the cask designer used acceptable methods to analyze or test the system and evaluate the thermal design. If we have any questions or concerns, we ask the designer for more information. Only when we are satisfied that our requirements are met will we approve the thermal analysis in a cask application. The potential for criticality is an important thing to consider about reactor fuel throughout its life. Fuel is most likely to go critical when it is fresh. 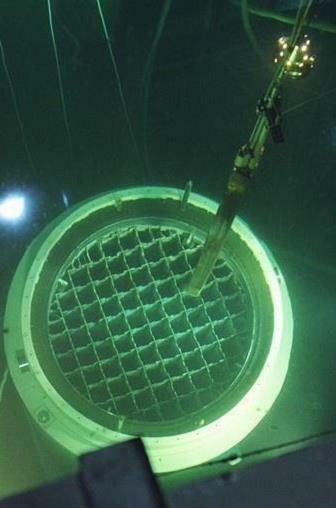 It is removed from the reactor after several years (typically four to six) because it will no longer easily support a self-sustaining chain reaction. This “spent fuel” is placed into a storage pool. After cooling for some time in a pool, the fuel may be put into dry storage casks. 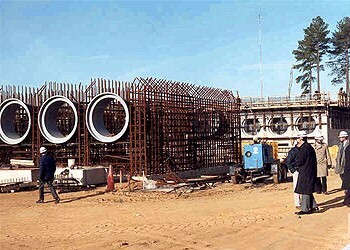 Here, a spent fuel assembly is loaded into a dry storage cask. When fuel is removed from the reactor, we require licensees to ensure it will never again be critical. This state is referred to as “subcriticality.” Preventing an inadvertent criticality event is one safety goal of our regulations. Subcriticality is required whether the fuel is stored in a pool or a dry cask. We require it for both normal operating conditions and any accident that could occur at any time. There are many methods that help to control criticality. 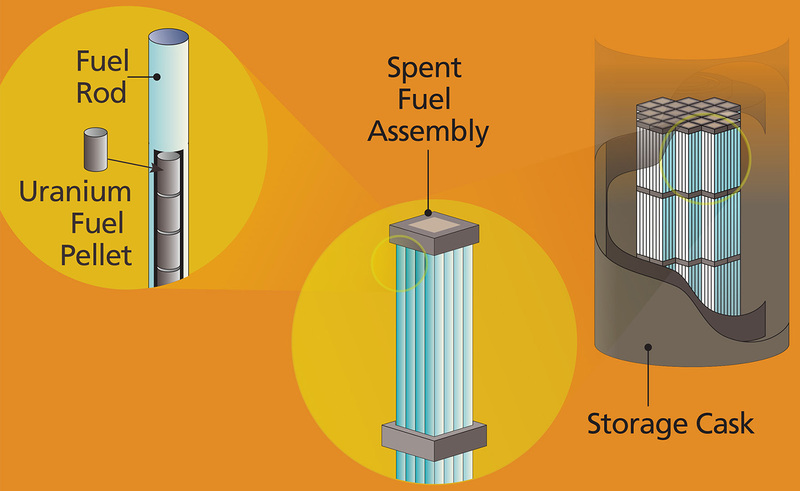 The way spent fuel assemblies are positioned is an important one. How close they are to each other and the burnup of (or amount of energy extracted from) nearby assemblies all have an impact. This method of control is referred to as fuel geometry. Certain chemicals, such as boron, can also slow down a chain reaction. Known as a “neutron absorber,” boron captures neutrons released during fission, and keeps them from striking uranium atoms. Fuel burnup is another factor. As we said above, after some time in the reactor it is harder for fuel to sustain a chain reaction. The longer the fuel is in the reactor, the less likely it is to go critical. However, high burnup fuel generates greater heat loads and radiation, which must be taken into account. Spent fuel storage cask designs often rely on design features to make sure the fuel remains subcritical. When we review a cask design, this is one of the key elements the NRC looks at in detail. Casks have strong “baskets” to maintain fuel geometry. They also have solid neutron absorbers, typically made of aluminum and boron, between fuel assemblies. The applications that we review must include an analysis of all the elements that contribute to criticality safety. Part of the analysis is a 3-D model that shows how the fuel will act in normal and accident conditions. A dry storage canister is loaded into a horizontal storage module. Our technical experts review this analysis to make sure the factors that could affect criticality have been identified. We check to see that the models address each of these factors in a realistic way. In cases where the models require assumptions, we make sure they are conservative. That means they result in more challenging conditions than we would actually expect. We also create our own computer models to confirm that the design meets our regulatory requirements. We will only approve a storage cask design if, in addition to meeting other safety requirements, our criticality experts are satisfied that our subcriticality safety requirements have been met. Our reviewers look at several other technical areas in depth any time we receive an application for a spent fuel storage cask. We will talk about some of the others—materials, thermal, and shielding—in future posts. We talked back in March about dry casks for storing spent nuclear fuel and how they work. Today we want to introduce you to the different things the NRC looks at each time we review a cask application. To recap: spent fuel is placed into cooling pools at reactor sites when it can no longer efficiently sustain a nuclear reaction. Dry casks give utilities an alternate way to store their spent fuel, freeing up space in the pools. They were first developed back in the 1980s because space in the pools – designed for temporary storage – was growing short. Our requirements for dry cask storage can be found in 10 CFR Part 72. All structures, systems and components important to safety must meet quality standards for design, fabrication and testing. And they must be structurally able to withstand wind, rain, snow and ice, temperature extremes, hurricanes and tornadoes, earthquakes, and fires and explosions. Part 72 and related NRC guidance on casks and storage facilities also detail specific engineering requirements. Casks must be designed to keep water out so the fuel can’t have a chain reaction, as it would in a reactor. The casks must also shield workers and the public from radiation. They must safely remove the heat remaining in the spent fuel. And the materials used in dry casks and their physical properties must be well-understood and analyzed. The NRC has dozens of experts in different scientific and engineering disciplines whose job is to review cask applications (which can be hundreds of pages long) and the detailed technical designs they contain. We will explain in more detail in later blog posts what our experts look for and how they go about approving a cask design.